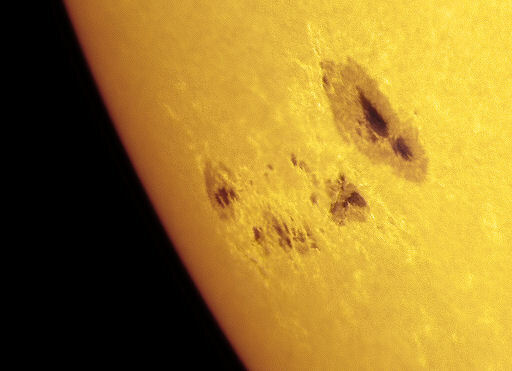 BIG SUNSPOT: One of the largest sunspot groups in years rotated over the sun’s northeastern limb this weekend. With a least four dark cores larger than Earth, AR1476 sprawls more than 100,000 km from end to end, and makes an easy target for backyard solar telescopes. Amateur astronomer Alan Friedman sends this picture of the behemoth from his backyard in Buffalo, NY: “AR1476 is firecrackler,” says Friedman. Indeed, the active region is crackling with impulsive M-class solar flares. Based on the sunspot’s complex ‘beta-gamma’ magnetic field, NOAA forecasters estimate a 75% chance of more M-flares during the next 24 hours. There is also a 10% chance of powerful X-flares.